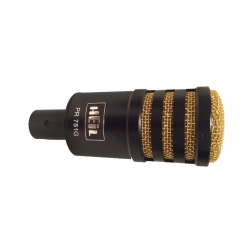 This studio quality microphone has excellent sound to go with its stunning good looks. It was specifically designed for use with most makes of Elite transceivers of Kenwood, Yaesu, Ten Tec, iCOM and DZKit. This is a truly remarkable dynamic microphone. Heil engineers were requested by iCOM to develop a very special microphone package for their new iC 7800 radio, but the PR 781 is a beautiful performer into just about any microphone input, such as Kenwood TS 870, 950, IC-756 Pro 1, 2, 3, 7000 series, Yaesu FT-1000MP, MK 5, 2000, 9000 and DZKit Sienna. Using one of the dynamic elements from the Heil broadcast division, the PR 781 offers beautiful wide frequency response while keeping that traditional Heil Sound articulation of the speech pattern. The PR 781 comes with the SM 3 mount, which works with the desk stand (CB-1-PTT), or the boom. NOTE: This mic has no PTT switch. If one is desired, a hand switch (HS-1) or footswitch (FS-2 or FS-3) can be plugged into the CC-1 cable (not included), or you can use the momentary switch built into the CB-1-PTT desk stand.